We are back with a new version of AdminDroid Office 365 Reporter v.3.6.0.0. As always, the new version comes with many new exciting & delicious features! Wanna take a sneak peek of what’s on the table? 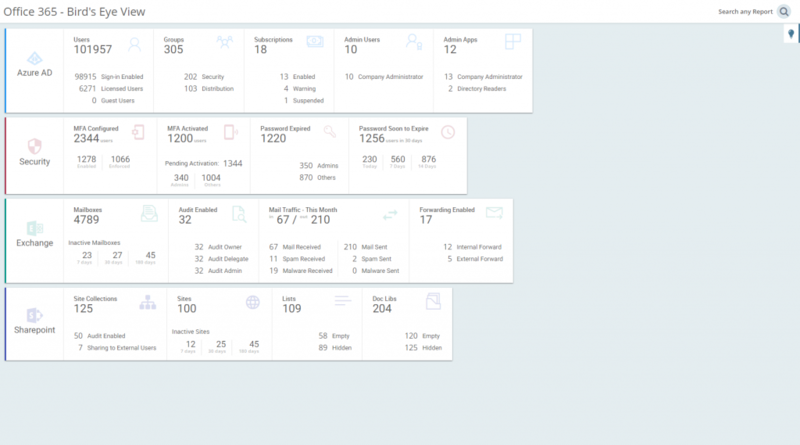 100+ New Reports on Office 365 Secure Score data with history, MFA/2FA settings and status, Detailed License Expiry info, Subscription usage info, Password Expiry Info, and so on. 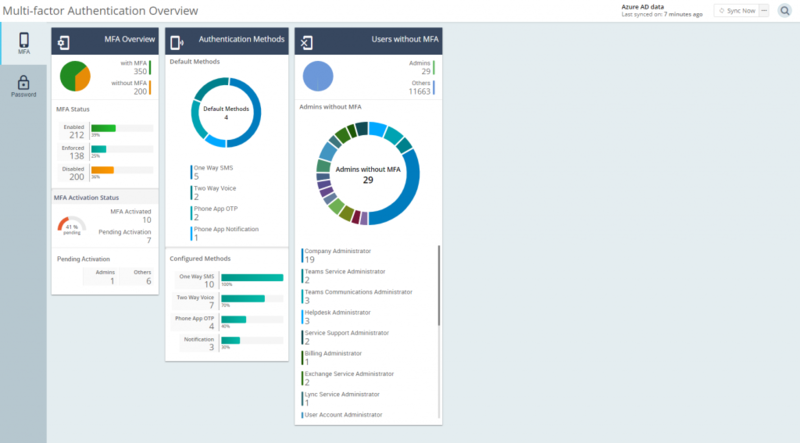 2 New Dashboards on Security that shows insights on MFA usage, and Password status of the users in your tenant along with Admin Role based categories. Many useful enhancements like Support for Modern SharePoint Sites, Detailed Report Result view, Smart Proxy, Easy renewal and so on. I know it smells good! Let’s take a quick bite. Gives a bird’s eye view of your organization security with insights on MFA/2FA and users’ password status. MFA Dashboard – displays the overview of MFA status of all your users along with their activation status, authentication methods used – both default and alternate methods, and categorized view on Admins without MFA. 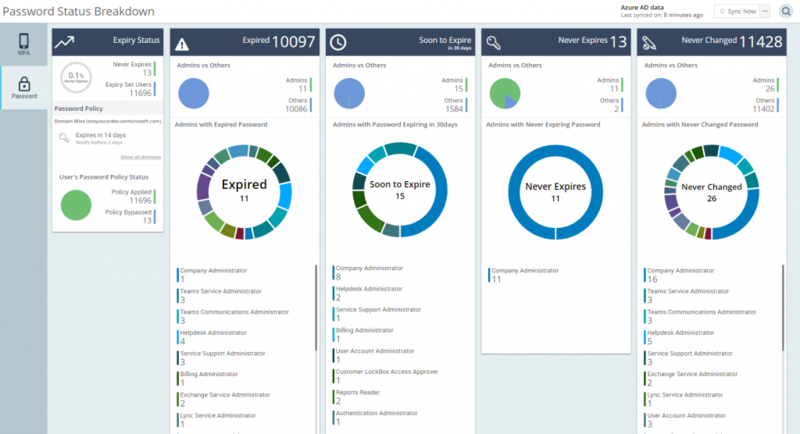 Password Status Breakdown – presents a complete overview of your organization password policies, users password status such as Expired, Soon to expire, Never expire and Never changed with categorized view on Admins based on their roles. We have added 60+ reports to analyze your organization’s security. You don’t have to hop to a different Admin Center for Office 365 Secure Score anymore. AdminDroid collects and retains your secure score data permanently for you to audit anytime. You can now customize, export, and schedule the Secure Score reports as per your need. You know our AI-based search, just Ctrl+Shift+F your way through any report by just giving a few keywords. A bunch of new reports that categorize users based on their MFA status, authentication methods, activation status, the devices used, and more. Reports on Password Expiry status of users in detail with different reports tailor-made for various requirements such as Users with expired passwords, soon to expire passwords, never changed passwords, passwords not changed for several days, and more. You can also verify your password policy. Many reports on Soon to Expire users, Subscription Expired users, Trial Expiring users, and Users with Suspended subscriptions and detailed subscription status and usage in your tenant. Report Performance – Now AdminDroid will load reports rapidly and get your schedules delivered quickly even if it has millions of records. Detailed Report Result View – Click on any report row to get the detailed view of the result with all the details you need. Smart Proxy – Improved the ability to detect and configure the proxy. Even if the proxy settings are enforced, when you switch to a non-proxy network, AdminDroid automatically establishes the connection without the proxy. Easy Renewal – You can now renew your AdminDroid license easily, right from your AdminDroid portal. Oh! We missed to mention about a play-buddy we kept for you inside AdminDroid. Download the latest version to meet your buddy and see all our features in Action. Share how you like the new buddy with us! If you already have AdminDroid, you will be automatically updated to the latest version. For detailed info on the new feature in this version and earlier versions, please refer our release notes. Still Hungry? Share what you want with us?